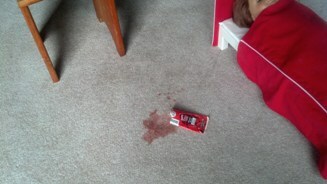 Red stains on your Warrington PA carpet can seem impossible to remove. Don't give up hope, we have the expertise to remove even the most challenging stain of color. Carpet stains come in a rainbow of colors and from many sources. Generally speaking a colored stain can be classified as either synthetic (man made) or organic (occurs naturally). The basic difference between a synthetic stain and an organic stain is in how the color is produced. The reason these types of stains are so difficult to remove is because the stain color is an added dye(s). Very often this dye is absorbed into the carpet or upholstery fiber. Since organic stains are caused by colors that occur naturally in the staining material, you would think they are more easily removed. Although true in theory, the reality is many food producers add synthetic dyes to give the food product a richer, bolder look. A good example is instant coffee or tea bags or even prepared tomato sauces. Without the color enhancing dyes, the tea or coffee will look weak and the sauce somewhat anemic. Although adding synthetic dyes to food makes the food appear more appetizing, it complicates stain removal. If you have colored stains on your carpet and or upholstery, your first inclination is to remove it with a carpet stain remover. Since these products generally don't work (except in TV infomercials), the next step is to try whatever is under the kitchen sink or worse, bleach. Couple that with aggressive scrubbing and you have damaged, distorted carpet pile that's stained red and loaded with "cleaners". From a carpet cleaner's standpoint, is the color of the stain from a synthetic dye or an organic source? From your standpoint, you just want the stain removed. Whether the stain source is synthetic or organic, we have the products and expertise to remove most any colored stain from your carpet or upholstery in the Warrington, PA 18976 area. 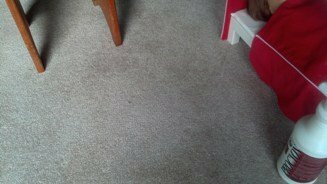 Call for a free, no obligation stain removal assessment or carpet cleaning assessment. Call 215-343-3600 today. We can make it look like it never happened.